Nanoporous polyethylene reflects visible sunlight, but it allows heat to escape. Such material could be used to create clothes that help keep people cool. (Inside Science) -- Researchers have made a new fabric that could bring the cooling properties of a business suit much closer to those of a birthday suit. Yet public modesty is safe -- while the fabric is mostly see-through to thermal radiation from body heat, it blocks visible light just as well as traditional cotton. "By enabling your radiation to escape there will be a huge amount of cooling power that you can feel," said Po-Chun Hsu, a materials scientist at Stanford University in California. Hsu and his colleagues describe the fabric in a paper published today in the journal Science. Most clothing is made from materials such as cotton or polyester that trap body heat. This is good for a cold day, but can make long-sleeved attire uncomfortable in hot, clammy weather. Wearing heat-trapping clothing can also have environmental drawbacks. The majority of American homes and businesses are cooled with power-hungry air-conditioning units that gobble up roughly 5 percent of all U.S. electricity produced, according to the U.S. Department of Energy. If our clothing kept us cooler in summer, then we could use less AC and save energy. 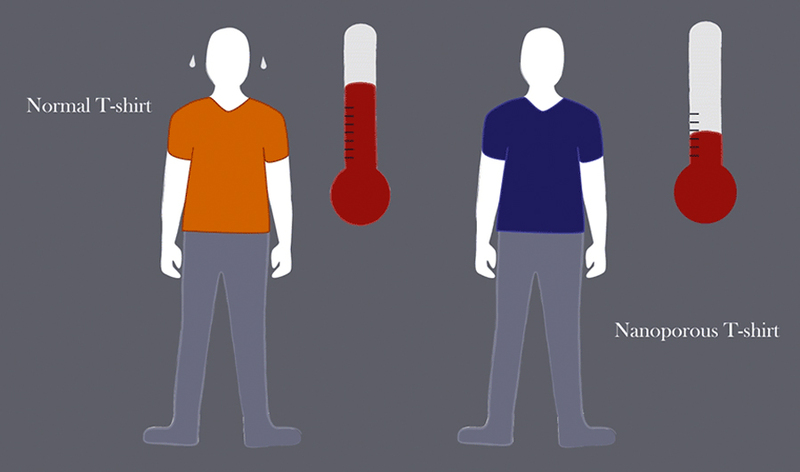 The researchers calculate that wearing their fabric rather than cotton could make it comfortable to turn up the AC temperature setting by 2 degrees Celsius (3.8 degrees F), which would translate to saving approximately 20 percent of the energy devoted to cooling. Nanoporous polyethylene reflects visible sunlight, but allows heat to escape. Such material could be used to create clothes that help keep people cool. "The bigger picture of this project is to save building air-conditioning energy," Hsu said. "So we really focus on the indoor situation." The fabric would also work outside to block visible light and transmit body heat, but its ideal use might be cooling generally sedentary people in offices and homes. A human being at rest in room temperatures loses about half of his or her excess heat through infrared radiation, an invisible form of light that is picked up by night vision googles. About 30 percent is lost through the movement of air, called convection, and 20 percent from evaporative cooling of sweat, Hsu said. The textile industry generally focuses on designing garments that enhance convection and speed up sweat evaporation, but the large cooling potential from increasing infrared transparency is mostly unexplored territory, Hsu said. "We are one of the first groups to take the infrared radiation cooling concept into textiles." The new fabric is made from polyethylene, a common plastic that doesn't trap thermal radiation and is used in bags, bottles and shrink wrap. Shrink wrap clothing hasn't caught on though, likely because polyethylene is also normally clear and watertight. The researchers found ways around both problems. To make the fabric opaque, Hsu and his colleagues chose a variety of polyethelene that has tiny pores more than 100 times smaller than the thickness of a sheet of paper. Called nanoPE, it is used commercially to separate the plus and minus sides of lithium-ion batteries and costs around $2 per square meter. The pores let the lithium ions travel through the battery, but also have the side effect of making nanoPE opaque, similar to the way tiny defects make frosted glass look white. The pores also let water vapor pass through. To make the fabric more permeable to air, the researchers used a tiny needle to punch it full of additional holes, each about the diameter of a human hair. They also treated it with a water-attracting coating so that sweat could spread along the fabric and evaporate more easily. For the final fabric, the researchers sandwiched a fine cotton mesh between two sheets of treated nanoPE to give the fabric strength, without trapping too much heat. The researchers claim the 3-ply fabric is comparable to cotton in many ways, including strength, opacity, and the way air and moisture pass through it. Further, it still transmits almost 80 percent of infrared radiation produced by the person wearing it. A plain nanoPE sheet transmits around 96 percent of human body radiation and cotton only transmits 1.5 percent. This blending of infrared transparency with many other characteristics important for textiles is the most important takeaway from the experiment, said Svetlana Boriskina, a physicist at MIT in Cambridge, Massachusetts, who was not involved in the research. She co-authored a 2015 paper that proposed a similar concept for cooling fabric and also wrote an article for Science discussing the context and implications of the Stanford researchers' results. "I am not sure that the modified nanoPE with a cotton mesh will by itself make it to the market as a cooling fabric product, but it certainly represents an important milestone in achieving such a goal," she wrote in an email. The missing pieces of the puzzle are the look and feel of the fabric, how well it holds up after being washed repeatedly, and the ability to find coloring agents that won't ruin the fabric's infrared transparency and wicking properties, she said. She also notes the fabric might find use in tents, buildings and vehicles, applications where a pleasant touch and variety of colors and patterns are not as important. Jonathan Chen, a materials scientist at the University of Texas at Austin who specializes in textiles, said the paper is a very good piece of research, but echoed the need to improve the wearability of the fabric to appeal to consumers. Hsu acknowledges that the fabric still basically feels like a plastic sheet. He said the team is working on ways to make the nanoPE into a woven textile, so that it will be soft and stretchable, and drape more like the fabric we wear every day. A woven nanoPE shirt may not ever feel quite as luxurious as high-thread-count Egyptian cotton, but for the environmentally conscious cubicle warrior, it could represent the next cool summer look.